Following plenty of books with an unreliable narrator, Steve Cavanagh gives us a whole book with an unreliable author. In Twisted Cavanagh takes a break from his eminently readable and engaging Eddie Flynn series to try something a little more meta. Twisted (the book within the book? The book that is the book?) is the latest novel by world famous bestselling thriller author JT Lebau, known for his killer twists. And Lebau is quite upfront at the start that as a reader you should not believe “a single word you read”. The cold open finds author Paul Cooper at the huge public funeral of JT Lebau, the completely reclusive thriller writer. No one has ever seen or met Lebau but plenty of the high and mighty have turned out to praise his work. Cooper is outside the funeral and is planning to shoot one of the high profile guests, but before he can do that he feels a hand on his shoulder and a voice calling him Lebau. Flashback to four months before and the little coastal town of Port Lonely where Paul’s wife Maria is having an affair and suspects not only that her husband may not be who he says he is but that he has kept a large fortune to himself. And so begins a twisty turny tale of fraud, murder, love, betrayal and revenge (but not necessarily in that order). To talk too much more about the plot would be to give away some of the obvious and less obvious twists. Suffice to say no one is who they say they are or who they appear to be except perhaps the dogged police officers who just know they are being lied to and that something is not right with pretty much every scenario they are presented with. 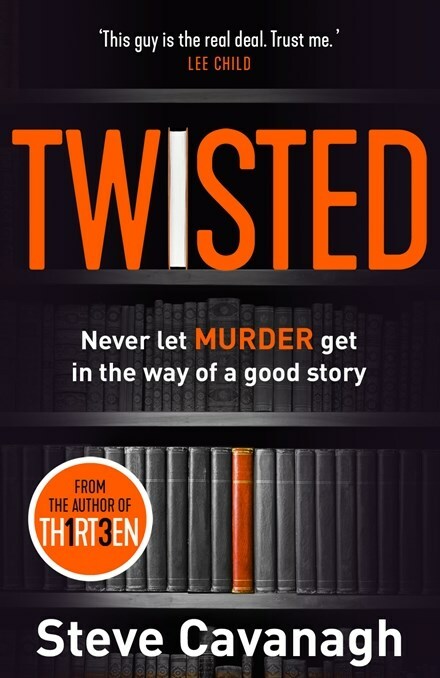 Among all of the murder and mayhem there is a serious question raised in Twisted. And that is: how much do you need to know about crime or personally experience to write a good crime novel? Could it be possible that the most atmospheric and realistic books about serial killers can only be written by serial killers? Or does it take some other form of slightly off kilter personality? In the end none of those philosophical questions matter as the plot (which takes a little while to kick into gear) gets going and the pieces are put into motion. As he has shown before, Cavanagh is expert at building narrative tension and that skill is well on display here as the police circle in and the other characters become more desperate. And while it is all a little extreme and a little hard to unpick the novel within the novel which is Twisted, the reader cannot complain that they were not warned. Lebau (and Cavanagh) was very upfront about that: don’t trust anything you read. All that is left after that warning is to sit back and enjoy the ride.